After last weekend’s fun but crowded visit to Coire an t’Sneachda, Debs and I both agreed we needed to up the adventure stakes for our next climb. We toyed with the idea of attempting something on the big bad Creag an Dubh Loch but after seeing a handful of pictures and making a few enquiries (thanks James!) we decided to try and find some ice on Eagles Rock instead. This slabby crag overlooks the western end of the Dubh Loch and with a 10km approach is rarely visited. 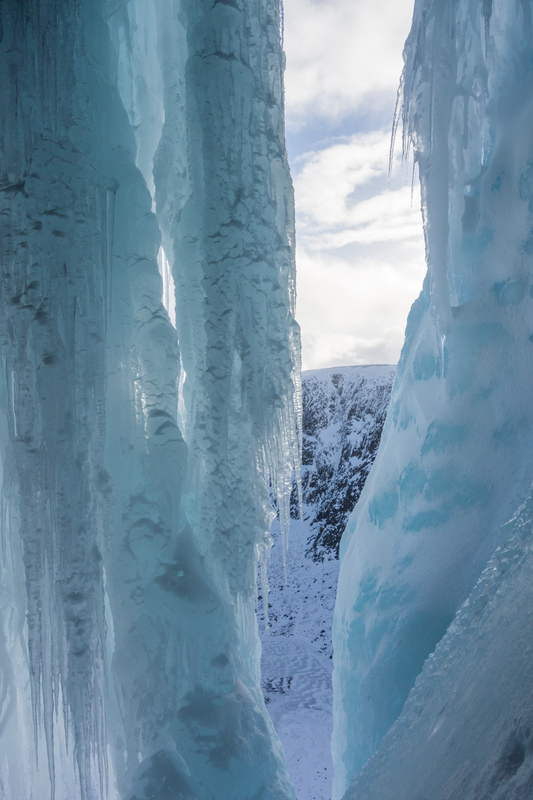 It’s probably best known for the summer HVS classic A Likely Story but with a good freeze some excellent icefalls form in the main drainage lines. 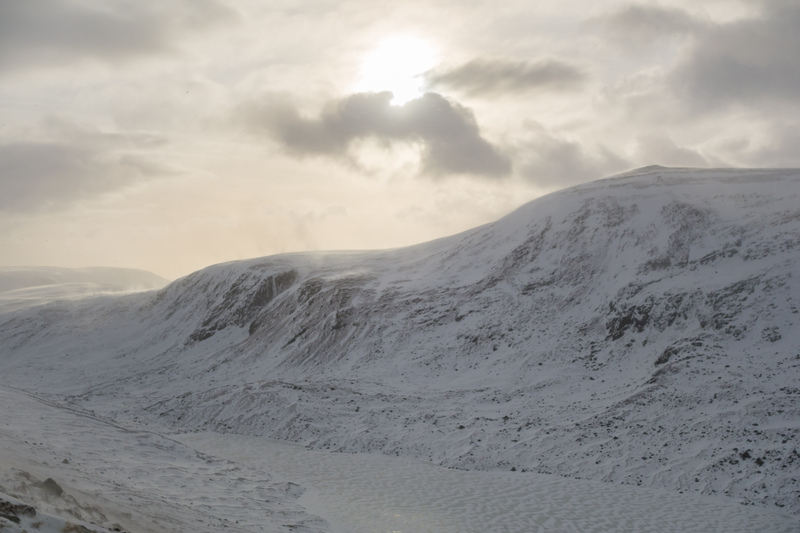 We began the long approach just before 6am and daylight caught us as we left the shores of Loch Muick and began the trudge up towards the Dubh Loch. The going was slow thanks to a mixture of deep crusty snow and a constant head wind, often accompanied by stinging icy snow pellets, but we got some good views nonetheless. 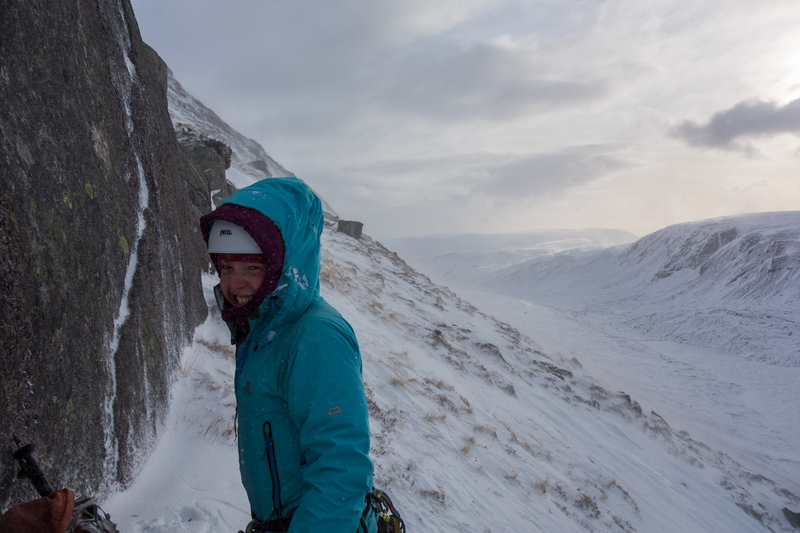 The next ninety minutes or so were utterly miserable – we lost the non-existent path continuously, Debs fell into two bogs and tiredness quickly began to overcome the desire to climb. What were we doing out here anyway?! At this point we were surprised to see a couple of figures behind us on the trail, catching up rapidly. We were overtaken level with the outflow of the Dubh Loch and while it appeared they were also headed to Eagles Rock, we weren’t complaining, as they put in a good trail for us (thanks guys!). 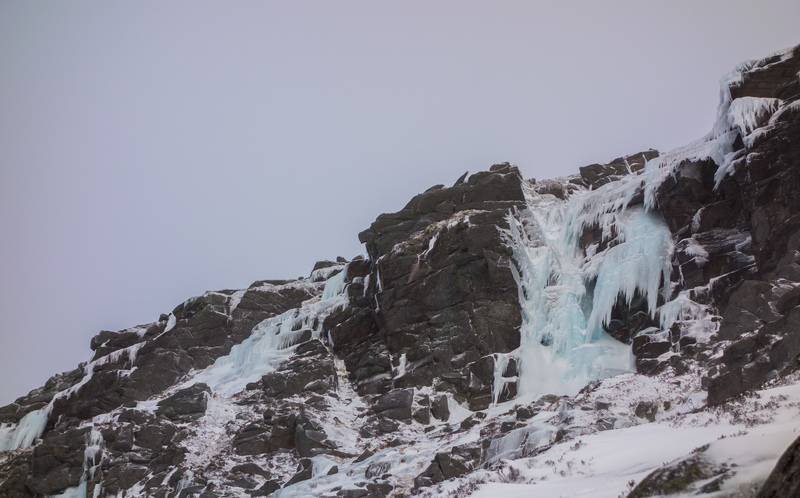 As we got closer to the cliff we could make out a fat blue cascade of ice at the end nearest to us. 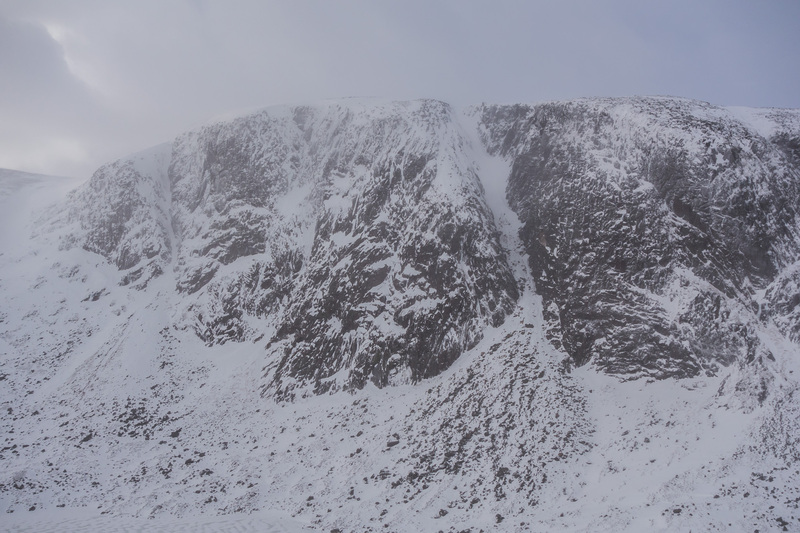 Remembering a picture I had seen on scottishwinter.com I figured it had to be The Drool (IV, 4) and with no desire to continue further we headed up towards it. The guys in front had the same plan and we caught them at a good gearing-up point just as they were about to start up the approach pitches. It turned out to be Callum and Uisdean and after a brief chat they proceeded to solo rapidly up the slabby terrain below the route. 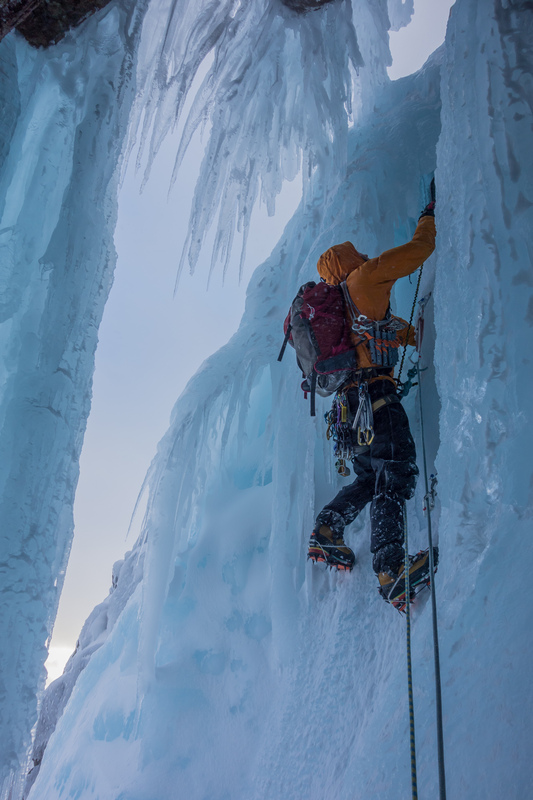 We took our time gearing-up having no desire to climb ice beneath another team, but in the end we should have hurried as by the time we started up the entry pitches they had already reached the start of the ice and had began soloing that as well! We didn’t fancy soloing so I tied on thinking it would only take a few minutes to run the rope out. I followed Callum and Uidean’s footprints up unconsolidated snow and after 30m came to a sketchy rising traverse over powder-covered slabs. Not wanting to risk a nasty slide back down to Debs, I spent quite a while searching for a gear placement, eventually finding one up to the right. I down-climbed back to the traverse and now with massive rope drag teetered up and across it. The rope came tight and after a few metres of simul-climbing I belayed to a peg and poor nut, still a long way beneath the main event. 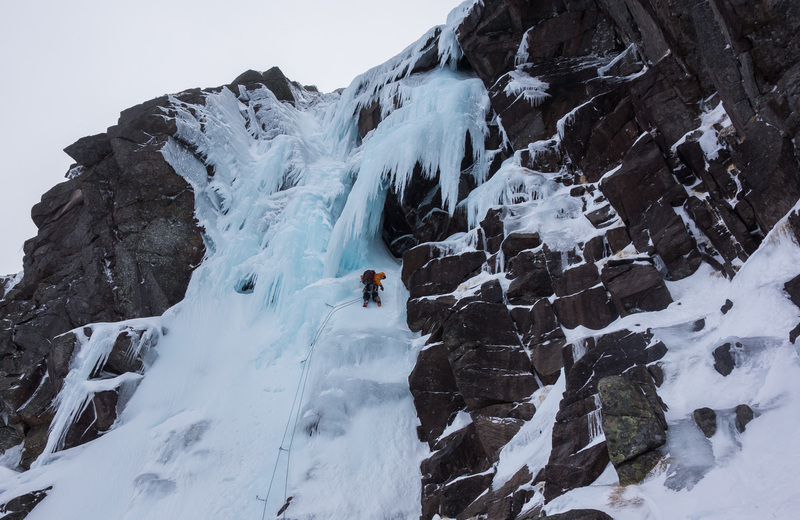 We had completely underestimated the distance to the start of the ice and Debs had to lead another 60m pitch of grade II, devoid of protection, until a solid belay was found down and to the right of the icefall. Given the poor belays and lack of protection we should have just soloed after all! After two sketchy approach pitches it was time to concentrate and get on with some proper climbing! A calf-bursting ramp led up to the first bulge and after wasting time and energy placing two useless screws I eventually got a good placement in the chewy blue ice. 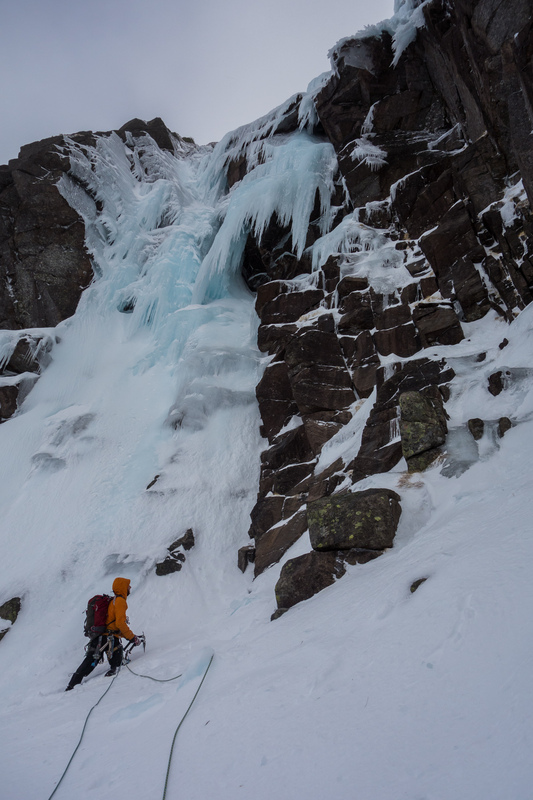 A few stiff pulls and some sideways shuffling saw me on the next ramp leading up into the cave behind the icicles. At this point the size of the hanging daggers became readily apparent but it was hard not to stop and marvel at them – twisted and gnarled due to their formation in strong winds. 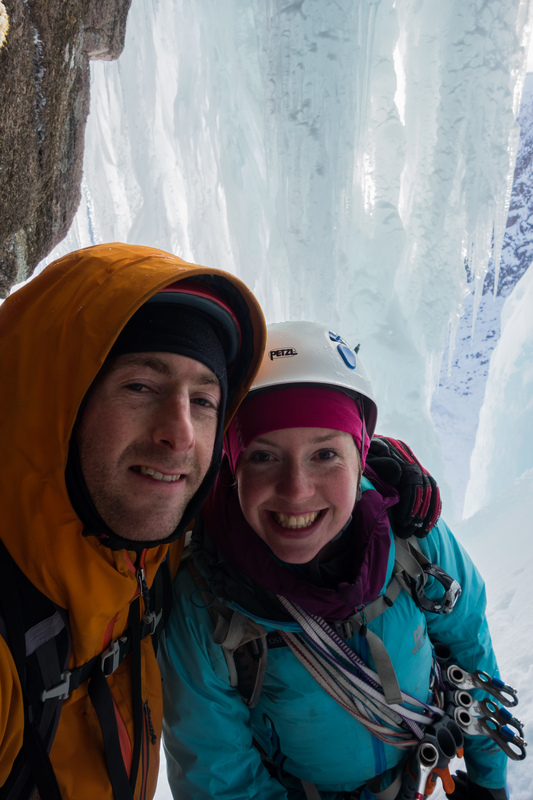 A bomber rock belay was constructed in the cave and I brought a grinning Debs up, the frustrating approach all-but-forgotten. 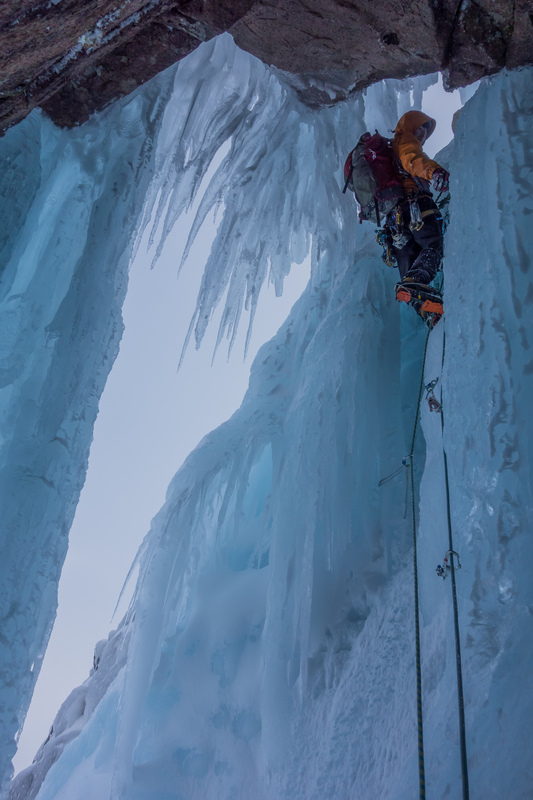 From the confines of our safe haven we could at last see what the next pitch would involve – the amenable-looking central line turned out to be nothing but a thin carapace above a large air gap and it transpired the only option was to climb a vertical pillar to the right, hidden from below behind the icicles. 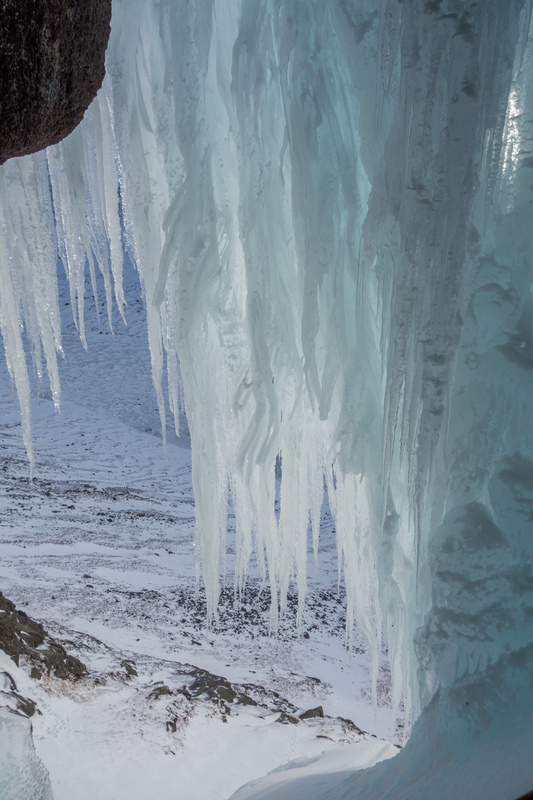 Scoping out the way ahead at the start of the crux pillar – the cavity under the ice to my left was amazing! I set off with some trepidation – cold hard reality had set in and what I had expected to be some grade IV cruising was looking like a fairly technical section of V, 6. Initially, the hollow ice to my left was helpful, providing the odd arm bar and good foot placement, but it soon forced me out on to the pillar proper. Thankfully a good foothold materialised and I was able to take a lot of weight off my arms while I placed a solid ice screw. After shaking the lactic acid out of my forearms, I climbed a bit higher to beneath the bulge leading out of the cave and onto the ramp above. Icicles framed my escape route and while I though I might be able to squeeze out without catching them I didn’t want to take the risk. I tapped the nearest one to me and rather more ice than I bargained for detached and fell on to my left leg, balancing precariously on my quad. With Debs safely out of the fall line in the cave below I tipped the ice away down to my left and pulled out of the gap to a brilliant stance above. 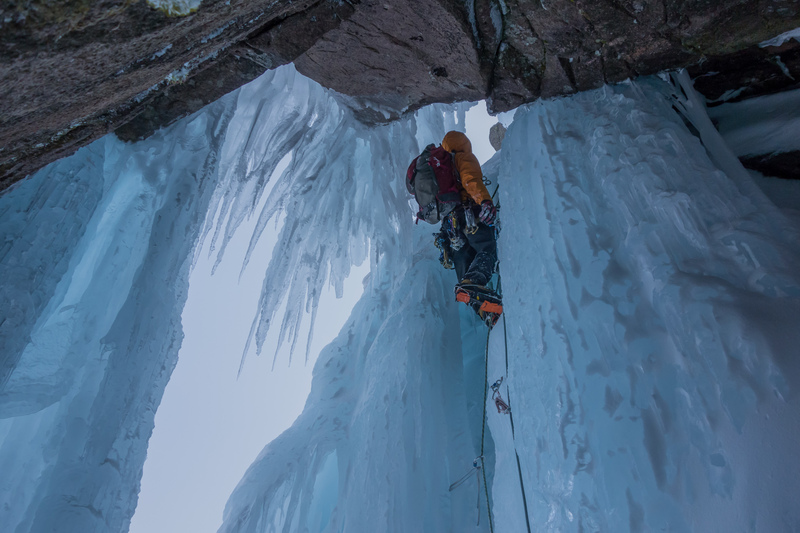 The next section contained some great climbing up an icy v-groove to some frozen turfy bulges. Pulling through these the angle eased back and after another short section of ice I found a great rock belay at the end of the difficulties. Debs seconded the pitch rapidly, making easy work of it to emerge beaming from ear to ear, before running the ropes away up to the plateau above. I followed quickly, conscious of the fact we had half an hour at most of daylight left. We packed up, had a quick drink and a bite to eat, located ourselves on the map and made sure we knew what bearings to follow to get us safely back down to the glen. Night came on quickly but we navigated without too many issues to bring ourselves back down to the path about a kilometre before Loch Muick. After what seemed like an eternity we arrived back at the car having had a much bigger day than originally planned – we had gone looking for adventure but it definitely found us first! Good work team. Sounds like a Hines punt!